To me, there is nothing better than a good outbreak book or movie. Or, heck, even a bad one. Whether modern-day virus hunters are investigating a mysterious outbreak in the Congo or survivors of a pandemic are rebuilding the world, I like them all. I especially love the whole idea of predicting and identifying emerging viruses, determining the source of outbreaks, tracking the spread of a virus through a population – all of it. In another life I’d work for the CDC, except I’m not really brave enough to don the Tyvek suit and work among patients in a hot zone or in a Biosafety Level 4 lab. This week’s Friday Fiction will give you what you need to create a somewhat realistic virus outbreak for your novel. Here are some of the things to consider when inventing your virus and outbreak scenario. Where does your virus come from? Many viruses that infect humans began in animals, most famously, flu viruses. For instance, Avian Flu viruses can infect farm animals such as chickens, pigs, and horses. When two different strains of influenza infect the same cell at once, they can combine to make a new virus which could infect people. If a virus jumps to a human, that doesn’t automatically mean it will spread from person to person. For awhile it may just infect individuals who are exposed to the animal carrying the virus. However, if the virus mutates or recombines again, it could begin spreading person to person. This is what happened with the recent 2009 H1N1 outbreak. Viruses can be transmitted from animals to humans through insect or animal bites as well. West Nile virus is transmitted by mosquitoes. Rabies can come from animal bites. Light contact or being face-to-face with an infected person – the virus is spread via water droplets in the air (coughing or sneezing) or by contact with items the victim has just sneezed or coughed on. Being in a space formerly occupied by a contagious person where the virus (such as measles) is suspended in the air. Contact with items that harbour the virus for long periods. “Vertical Transmission” in which fetuses acquire the virus from infected mothers. In all cases, the virus has to get inside the body. Merely having the virus “land” on a person’s skin is not enough to infect them. If not through intimate contact or respiration, then this is usually via transfer from a surface to the fingers, then to the mouth, eyes, or nose. How long does it take for your virus to induce symptoms once a person is exposed? This is the incubation period. For known viruses this ranges from a few days to about three weeks. Will the victim be contagious during the incubation period? How long are they contagious after they stop showing symptoms? The period of communicability is the total time during which an infected person is contagious. The range is wide for known viruses. HIV for instance is contagious throughout an infected person’s life. Measles is contagious from 4 days before the rash appears to 4 days after. 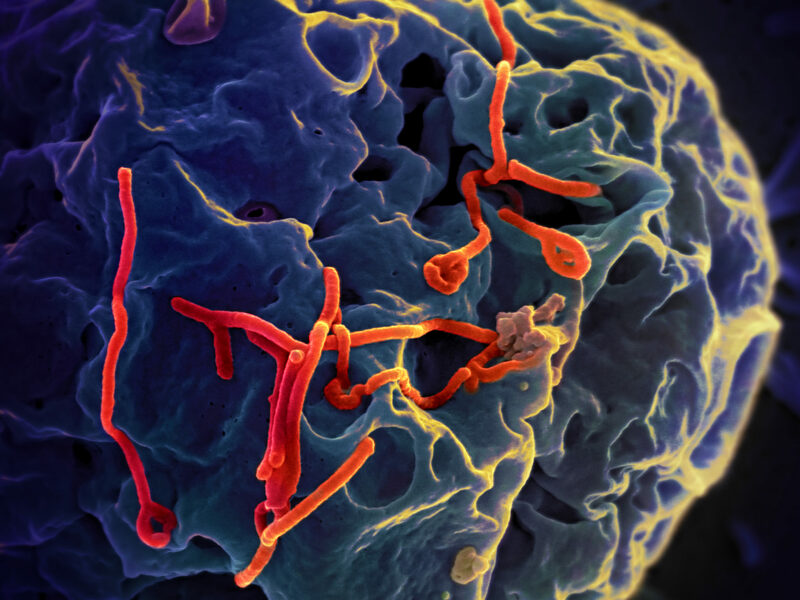 Ebola virus can be passed to others only when infected patients start to show symptoms. What does your virus do to people? Does it kill them quickly or slowly? Viruses that kill quickly tend to burn out fast. They wipe out populations in a single area before the victims are able to travel and spread the virus. Ebola (before widespread air travel) is a good example of this. Viruses such as flu that allow their victims to carry on with life while contagious tend to last longer in a population and spread farther, ultimately killing more people. To compare, the 2014 Ebola outbreak has killed fewer than 10,000 people worldwide to date. Even with much of the population vaccinated, seasonal flu kills 250,000 to 500,000 people worldwide every year. Does your virus have lasting effects on survivors? For instance, polio virus left victims crippled. Other viruses can cause brain damage. How long can your virus live on, say doorknobs, keyboards or on your hands? Viruses typically cannot live long outside of their host. As a rule they remain active longer on hard surfaces (stainless steel, plastic) than on soft surfaces such as fabric or skin. Cold viruses can survive on indoor surfaces for up to 7 days, but begin to lose their ability to infect within 24 hours. They can live on skin surfaces for only a few minutes. Measles can survive on surfaces and in the airspace where a contagious person has coughed or sneezed for several hours. Flu viruses can live on hard surfaces for 24 hours but on skin, only 5-15 minutes. In the lab, smallpox dies with 24 hours outside a person. In nature, sunlight would kill it sooner. This does not take into account viruses outside of a person but in dried or wet blood or other bodily fluids where it might live much longer. Is anyone immune to your virus? 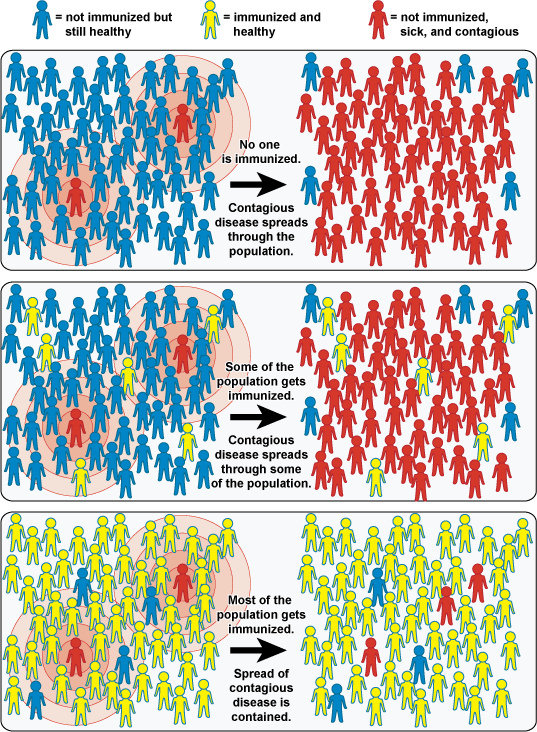 Immunity can be acquired by previous exposure to the same or a similar virus. Today, for instance, anyone born before 1957 is considered to be immune to the measles virus because before that year, almost everyone got measles. Those who didn’t die from it are, today, immune. Immunity can also be genetic. Some people (my husband included) are genetically immune from catching Norovirus. About 10% of Europeans are immune to HIV due to a genetic mutation called CCR5-delta 32. The high frequency of this mutation in the population is a result of the hemorrhagic plagues of the Middle Ages. The plague viruses used the CCR5 gene to get into victim’s immune system. Only people with the mutation survived and that mutation also protects against HIV. Now you have enough to at least get started writing your own outbreak story. Let me know when it’s done. I’d love to read it!